(M) Vintage 70's Mens Hawaiian Shirt! Bright Warm Colors w/ Palm Trees & Flowers! 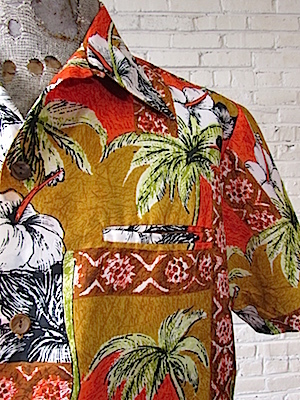 Home > Men's Vintage Shirts > Hawaiian Shirts > (M) Vintage 70's Mens Hawaiian Shirt! Bright Warm Colors w/ Palm Trees & Flowers! 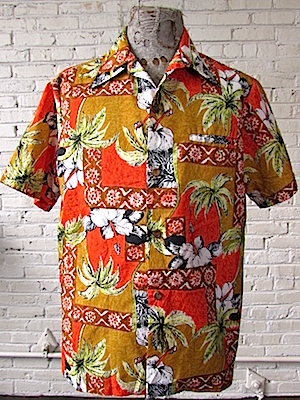 Vintage mens Hawaiian shirt in a in a wonderful palette of warm colors! The base of the shirt is made up of patches of vibrant orange and yellow ochre with green palm trees and black and white hibiscus flowers on top of them. Light brown bars with an orange and white flower like pattern are printed on top of the base colors and design. Has an extra wide 70's collar. Closes in the front with marbled brown buttons. Has on chest pocket and a straight hem. Tagged by Arnold Christensen. No Material Tag.